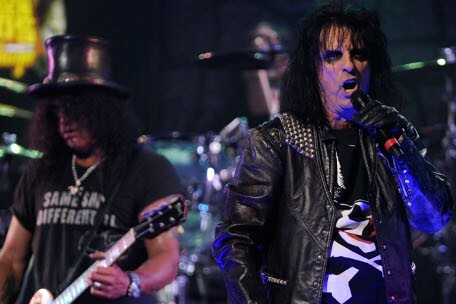 Last night in Los Angeles, the 2012 Revolver Golden Gods award show went down and it was a blast! While there were many highlights throughout the night, a pair of performances stood out amongst the rest. Taking the stage early in the night, Trivium wowed the huge crowd at Club Nokia when they invited Slipknot singer Corey Taylor and Machine Head's Robb Flynn up on stage for a ripping version of Metallica's "Creeping Death." The second highlight came towards the end of the award show when Johnny Depp joined Marilyn Manson on stage to add his guitar talent to "Sweet Dreams" and "The Beautiful People." Also joining them was The Pretty Reckless singer, and television actress, Taylor Momsen. Check out a photo gallery from the night, along with some video performances and a list of the night's winners, below.